What makes a fish tank ‘funky’? Something that is interesting, different and totally unique, that’s what! Let’s face it, most tanks are pretty darn boring. They all kind of look the same, and have similar designs that aren’t exactly ‘funky’. 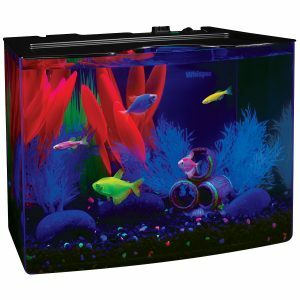 Luckily, there are loads of fun fish tanks out there that not only look great, but can also still be suitable for your fish. Because some of these ‘fun’ fish tanks sacrifice safety and usability for interesting and different. So we’ve selected these funky fish tanks based not only on how they look, but also how safe they are for fish. So let’s take a look at some of these fish tanks! This fish tank hotel is definitely funky, plus it’s totally safe for fish. It’s designed to be stackable, so you could purchase several of the tanks to stack on top of each other, providing even more space for your fish and making them even more comfortable. But it’s not just the spacious design that we like about this fish tank hotel, as it looks awesome too. There are ‘windows’ on the tank which help to add to the hotel style of the tank, and definitely make it look pretty funky! This is an extremely highly rated item on Amazon, with an average rating of 4 and a half stars from over 100 reviews. 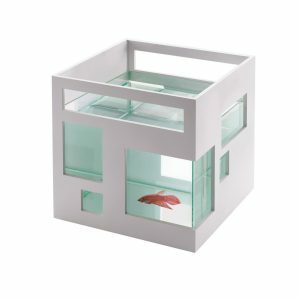 Many of the reviewers mention how much their fish seemed to enjoy this fish tank, and that it looks great in their home. If you’d like to read some more of these reviews, and find out more about the item, check it out on Amazon by clicking the green button above.